The Golden Cycle Mining Company was originally incorporated in 1885 by David H. Moffit, a Denver banker and financier. By 1900, the company had acquired many mining operations when it was sold to John T. Milliken of St. Louis. Milliken built the Golden Cycle Mill in 1906. He chose the site because the area had a good supply of water, the trains from Cripple Creek had a down hill run, and because of the availability of the vast supply of soft coal needed to roast the ore from the areas just north of Colorado Springs. Because of the high sulfide content of Cripple Creek ore, the smelting process required that the ore be crushed, roasted, and leached with cyanide. The coal necessary for roasting was close at hand near Rockrimmon, the Black Forest, and the present site of the Air Force Academy. It was proved cheaper to bring the gold to Colorado City, than to take the coal to Cripple Creek, and the Golden Cycle became one of the towns major employers. The working class neighbors around Colorado City were within walking distance of the mill. In 1907, a fire destroyed the mill, but Milliken had a more modern and efficient mill completed in 1908. The success of the Golden Cycle forced all other mills in the area out of business and it acquired most of the lucrative Cripple Creek business. Milliken sold the mill and most of his mines in Cripple Creek in 1915 to Albert Carlton. Carlton had several successful projects in the mining district and was the instrumental force in starting the Midland Terminal Railroad. The Midland terminal linked the mining district with the town of Divide. From there the ore was picked up by the Midland Railroad and transported to Colorado City. Now, with his purchase of the mill and over 100 mines from Milliken for $4.5 million, Carlton was crowned the "King of Cripple Creek". Carlton ran the railroad, mill and mines until his death in 1931. Albert's brother Lester took over the operations until his death in 1938, when Albert's widow, Ethel, ran the business. The Golden Cycle was then the only gold refining mill left in Colorado. 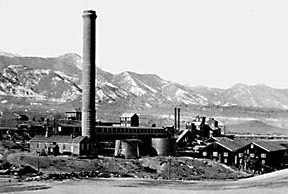 Mines in Park, Golden and Gilpin counties had to ship their ore by train to the Golden Cycle, where it was refined and sent on to the U.S. Mint in Denver. By 1935 the mill had processed 468,000 tons of ore at $11 per ton. 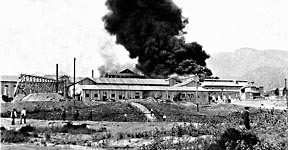 The mill kept more than 150 men working even during the depression. Gold was the only metal recovered at the Golden Cycle until World War II when the mill was converted to also refine lead, copper and zinc ore. In 1948, the Golden Cycle announced that it was dismantling the mill and moving it to Cripple Creek. The new mill would be more efficient, using less coal and needing only about 75 employees. The Golden Cycle processes about 14.5 million tons of ore in its 43 years of operation. The mill was dismantled in 1949. Most of its machinery was hauled to Cripple Creek and the buildings were torn down to their foundations. The tailing ponds and grounds were covered over with 6 to 8 inches of soil taken from the nearby hills. The dust from the mill had been a nuisance to Colorado City residents for years. The slag piles that extended the mesa almost to Fountain Creek and the mill's smokestack were lest behind. The Golden Cycle mill in Cripple Creek operated until 1962.